Anna Ansari - Burns Anderson Jury & Brenner, L.L.P. Anna hails from Marshall, Texas, famous for its pottery and the Wonderland of Lights. 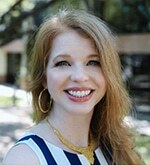 Despite being an Aggie, she fell in love with Austin and joined the BAJB team in 2007, fresh out of law school and anxiously awaiting her bar results. The results were in, favorably, and she has been with the firm ever since. Anna focuses on workers’ compensation and insurance defense. She finds the ever changing legal horizon of both these areas of the law intriguing and a perfect fit for her desire to become a passionate advocate for her clients.